In 1993 when Lulu joined Take That on their chart-topping hit Relight My Fire, she broke a record for the longest gap between debut hit and first number one when she waited almost 29½ years. Four years earlier Gene Pitney had finally made the summit accompanied by Marc Almond with a remake of Gene’s own 1967 hit Something’s Gotten Hold Of My Heart giving him a gap of almost 28 years. 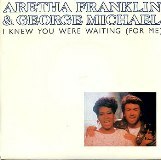 But before those two Aretha Franklin held the record of almost 20 years between Respect in June 1967 and joining George Michael on I Knew You Were Waiting (For Me) in 1987. The story was quite different for George who, in the UK, was racking up his third consecutive chart topper following Careless Whisper and A Different Corner. Aretha’s career had waned in the UK since the mid-70s and it was her appearance in the 1980 film The Blues Brothers that gave her the boost she needed. The song was written by both Dennis Morgan and Simon Climie. Morgan was born in 1952 on a farm in Tracy, Minnesota and at the age of 11 after seeing the Beatles on the Ed Sullivan show, got a guitar and started playing in bands and writing songs which led to him receiving a solo recording offer with a record company that took him to Nashville for the first time to do some demos. Simon Climie explained how he began, “I started as a songwriter without a huge ambition to be a rock star, but when I met Rob Fisher at Abbey Road (he’d already had some success with his band Naked Eyes as part of the British invasion) we wanted to write songs and both loved experimenting in the studios,” and both became session musicians at Abbey Road. Simon’s father, David, was a TV comedy writer who had success in the 50s, 60s and 70s with the shows The Army Game, Oh Brother, Bootsie and Snudge and That Was the Week That Was. Morgan came to the UK in 1983 to see The Everly Brothers’ reunion at the Royal Albert Hall. After the show, he went to Stingfellows with Phil Everly and was introduced to Simon Climie. They developed a friendship and mutual interests which led them to begin writing songs together. The song was produced by Narada Michael Walden which made things a little tough for George because since the Wham! days he usually did his own production work. Before this song he had only been produced by someone else on one occasion which was Band Aid’s Do They Know It’s Christmas? That song was a one-off project. George has since recorded duets with Elton John, Lisa Stansfield, Queen, Mary J. Blige and Whitney Houston. Aretha also recorded duets with Elton and Whitney. She still sounds amazing but if you want to see her live you’ll have to travel to the States as Ms Franklin won’t travel overseas because she has a phobia of flying. George also still sounds good and still has an army of fans, but unfortunately it’s his ‘other activities’ and ‘failures’ that the press only seem to be interested in these days and George really doesn’t do himself any favours to counteract that.